Hinshaw, Charles, head-of-household, age 40, born in Illinois; parents birthplace not shown; owned home; house painter. 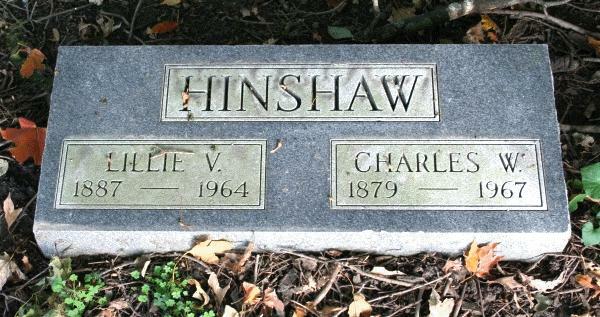 Hinshaw, Lillie, wife, age 33, born in Illinois; parents born in Illinois. Hinshaw, Dwynn [unclear], son, age 11, born in Illinois; parents born in Illinois; attended school. Hinshaw, Velma, daughter, age 6, born in Illinois; parents born in Illinois; attended school. Hinshaw, Virginia, daughter, age 10 months [unclear], born in Illinois; parents born in Illinois. Hinshaw, Charles W., head-of-household, age 61, born in Illinois; completed 2 years of high school; on Apr 1 1935 was living in the same house; owned home ($800 value); occupation: painter, buildings; worked 30 weeks in 1939; $0 wages in 1939, plus other income. Hinshaw, Lillie V., wife, age 53, born in Illinois; completed 8th grade; on Apr 1 1935 was living in the same house. Hinshaw, Veronica R., daughter, age 13, born in Illinois; completed 6th grade; on Apr 1 1935 was living in the same house; attended school. Contribution from Leslie Barringer (). 1920 census, Chenoa Township, McLean County, Illinois; roll T625-387, ED 124, page 7B, line #83, dwelling #170, family #171. Obituary of Valma J. Hinshaw. 1940 census, Chenoa, Livingston County, Illinois; roll T627-842, ED 57-42, page 14B, line #76, household #351.
courtesy of Sharon Newcomer (). Ancestry Family Tree data "Zimmer & Mikesell Family Tree" posted by "lanoreg". 1900 census, Eppards Point Township, Livingston County, Illinois; roll T623-318, ED 98, page 1B, line #68, dwelling #12, family #12. "Marriage Records of McLean County, Illinois" by Lilah Smith & Verda Gerwick; Heritage House, Danville, IL 1971. GEDCOM file h8789.ged at http://www.ancestry.com. 1940 census, Chenoa, Livingston County, Illinois; roll T627-842, ED 57-42, page 14B, line #71, household #349.